The Scriptural holy days of the Most High display His plan, and in performing them, we take part in affirming that He has His work of redemption laid forth in the Word. Passover is probably the most widely-recognized Biblical festival among believers, for its merit as the astonishing rescue of the people of Israel from Egypt with the slaying of the lamb, and the later fulfillment of it again with the rescue of the souls of men by the death of Firstborn of the Most High – Yeshua the Messiah. There are amazing parallels between the first Passover and the Passover on which Messiah was offered as the heaven-sent Lamb. The Passover memorializes redemption from slavery both physical and spiritual. 15 And you shall count for yourself from the morning after the Sabbath, from the day that you brought the sheaf of the wave-offering; seven Sabbaths complete shall be. 16 Until the morning after the seventh Sabbath you shall count, the fiftieth day, and you shall bring near a new gift to YHWH. The holy day of Shavuot is arrived-at by counting seven Sabbaths – one Sabbath a week, and then one more day. This time commemorates the giving of the divine Torah (Law) to Israel at Mount Sinai after their escape from Egypt, and about 1,500 years later, the giving of the Spirit of Holiness at Jerusalem to those who followed Yeshua. The giving of the Torah to the people at Sinai was to create an entire nation of priests devoted to living the laws of a divine Kingdom here on earth, and to share that with the world. The giving of the Spirit of Holiness was to further progress that desire for a nation of priests. In this way, the festival of Shavuot / Pentecost can be said to arguably be the most important in terms of reach for the entire world. The Hebrew people were responsible for sharing the reality of the Creator of heaven and earth with sojourners in the land, as well as embarking on ancient missions to foreign lands to spread the Word of His reality to Gentiles. In like manner, the giving of the Spirit of Holiness at Jerusalem enabled the heart of the Holy One to be spread across borders and language barriers like never before. In this way through the use of His holy festivals, the covenants of the Most High were disseminated around the known world. The fulfillment of the festival of Shavuot / Pentecost hold amazing parallels between the initial giving of the Torah and the later giving of the Spirit of Holiness. While the intimacy of the original intent of the event of Shavuot has unfortunately suffered greatly by an improper assessment of a portrayal of the holy day through the teachings of mainstream Christianity, the truth is that the core of the original holy day of Shavuot reveals the heart of the Father for His people in beautiful ways. While mainstream Christian teachers so often attempt to paint a portrait of “Law versus Spirit” when discussing the event in light of its second fulfillment in the book of Acts chapter 2, the heart of the Father was to show His people that the two events are actually one and the same in what the Holy One desired to accomplish. This unity between the events needs to be illuminated and appreciated for the work He intended it to do in our hearts to be performed. There are wonderful parallels between the two historical days that show the prophetic hand of the Most High at work in the world to reclaim those who bore His image so long ago in the Garden. These parallels help us to see that the redemptive works of the Most High are at odds with each other, but are a progressive revelation that builds upon what has come before, adding to it and making it greater, and never diminishing what has already been commanded to be eternally performed in His Kingdom. A careful look at the parallels of the events shows us the unity of His Torah and His Spirit at work among His people. The first time the festival of Shavuot was observed came at the foot of Sinai, after the freed people of Israel left the idolatrous borders of Egypt and crossed the Red Sea by the miraculous intervention of the Holy One. Let us read the events that directly lead up to the giving of the Torah at Sinai, recorded for us in Exodus 19:16-25. 16 And it came to be on the third day there were voices, and lightning, and a heavy cloud was upon the mountain. And a sound of a ram’s horn was very strong, and all the people were trembling in the camp. 17 And Mosheh brought forth the people to meet Elohim from out of the camp, and they stood at the bottom of the mountain. 18 And Mount Seena was entirely [in] smoke from the Presence, because YHWH descended upon it in fire, and its smoke ascended as smoke of the furnace, and the entire mountain trembled much. 19 And when the sound of the shofar went on and was very strong, Mosheh spoke, and Elohim answered him with a voice. 20 And YHWH descended upon mount Seena, on the head of the mountain, and YHWH called for Mosheh to the head of the mountain, and Mosheh ascended. 21 And YHWH said to Mosheh, “Descend, charge to the people, lest they pull down [the boundary erected in v.12] to YHWH, to see, and many from them fall. 25 And Mosheh descended to the people, and spoke to them. The events recorded here are truly amazing. The Most High pulled back the fabric of time and space that normally separates the grandeur of His Presence from this sin-scarred world, and showed up in a powerful and utterly memorable way. The above verse is a very literal translation I have rendered straight from the scroll of Torah. Notice that the normal physics of the material world were being affected by the Presence of the Creator in such an unusually close proximity to His creation. For starters, we read that the Hebrew tells us there were “voices” heard in verse 16. Probably every single English translation you will read renders the Hebrew term here of QOLOT as “thunder,” and yet this is not the Hebrew word that actually means “thunder,” which is instead RA’AM. Rather, this term literally means “vocalic sounds.” That is – voices. 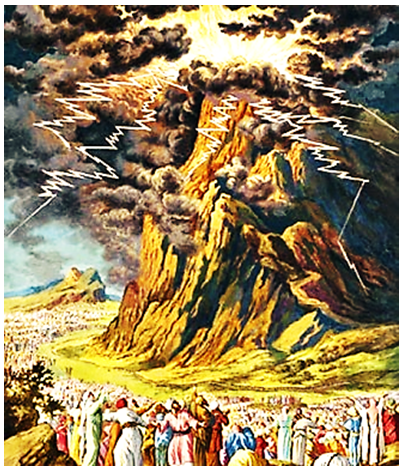 The placement of the term next to “lightning” has caused translators to translate dynamically rather than literally, which has done a disservice to the Hebrew text’s presentation of the utter uniqueness of the Shavuot event. I will return to this issue shortly in another verse for the reader to see that the assertion I am making with my choice of a literal translation for the term is actually further supported by the text itself. A second point of interest is the mention of a ram’s horn sounding (again, the singular term of QOL / “vocalic sound”) in verse 16. There was no human blowing that ram’s horn, and so we can only assume that it came from a heavenly source crossing over into this realm of the physical. In fact, this is the first time the musical instrument is ever mentioned in the Word, and it is introduced being blown by no human lung! For a more complete address of the particular topic, see my study VOICE OF THE SHOFAR. The text here further shows us the supernatural enormity of the event of the Spirit descending into this world by speaking of the Presence of the Holy One coming down in fire upon the mountain, making it not only billow with thick smoke, but also tremble as if a quaking volcano. The mountain is never mentioned as being itself a volcanic cone, nor ever erupting in devastation or harm to the environment and inhabitants around it. The detail that He descended in fire also quickly rules out an eruption, as volcanos spew debris into the air, which is not what is described in His coming here. It is instead the physical world responding to the overpowering Presence of the Most High as He peeked into our material realm. The text continues on, however, explaining that the show was not nearly over, but had just begun. Moses obeyed the command of the Creator, and in Exodus 20:2-17, we read the following words were declared to the nation. 2 “I am YHWH your Elohim, who brought you forth from the land of Mitzrayim, from the house of slavery. 3 You shall have no other elohim before My face. 4 You shall not make for yourself a carved image, or any likeness which is in the heavens from above, and which is in the earth from beneath, and which is in the waters from under the earth. 6 and performing kindness to thousands who love Me, and who keep My commandments. 7 Do not lift up the name of YHWH your Elohim for nothing, for YHWH will not purify him that lifts His name for nothing. 8 Remember the day of the Sabbath, to set it apart. 9 Six days you labor, and perform all your work. 10 And the seventh day is the Sabbath for YHWH your Elohim; [there is] no performance of any work – you, and your son, and your daughter, and your servant, and your female servant, and your cattle, and your sojourner who is in your gates. 11 For six days YHWH made the heavens and the earth, the sea and all that is in it, and rested on the seventh day. For this YHWH blessed the day of the Sabbath, and set it apart. 12 Esteem your father and your mother, in order that your days be extended upon the ground which YHWH your Elohim gives you. 16 Do not respond with your neighbor a false witness. 17 Do not covet the house of your neighbor. Do not covet the wife of your neighbor, and his servant, and his female servant, and his ox, and his donkey, and any which is your neighbor’s. ​The declaration made here is the framework of the Torah. It is the bones of the body of divine law that would be fleshed out in further chapters and books. All that would be revealed in the coming pages to Moses during His forty day stay atop the mountain is essentially contained here in these “bullet-point” passages. The famous stone tablets Moses was later given would be inscribed with these words. This is the heart of the Holy One for His Kingdom people. The intimate desire of the Creator of mankind to have a people who are His own in a world mindfully against Him are here displayed with the basic precepts of how to live with Him and one another. However, this heartfelt presentation did not exclude the fact of His Presence pouring over into this world in absolute power and wonder. The people who received the Master’s message could not stand the overwhelming nature of the event. Exodus 20:18 gives their reaction to the circumstances surrounding the presentation of His Word. And all the people saw the voices, and the torches, and the voice of the ram’s horn, and mountain’s smoke. And the people saw, and they moved, and stood far off. The disruption of normal physical law continued through the utterance of the Holy One to the people. 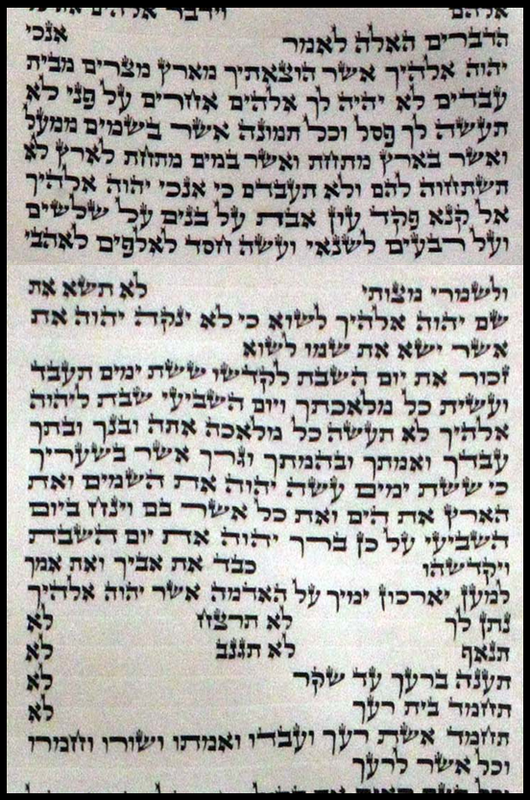 The text tells us that sound became sight here by telling us that Israel “saw the voices” – a detail that describes an actual neurological event known as synesthesia, where stimulation of one sense triggers an involuntary link to another sense, such as we have described here in the Hebrew of the people seeing sound! 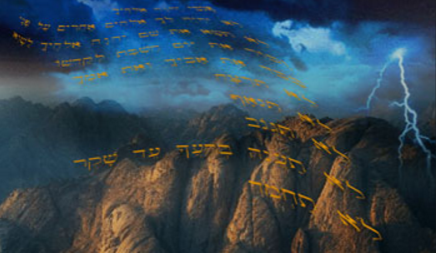 We cannot know exactly what was being experienced in this event – perhaps they were seeing the Hebrew language letters spoken in the air – the Ten Commandments reverberating from the mountain like a divine teleprompter? It is intriguing to guess at what form it may have taken, but it is clear that the mass synesthesia experienced by the people at Sinai was directly involved with the breaking-through of the spiritual Presence of the Most High into this material world. This term of QOLOT is again typically translated as “thunder” in most versions, and yet just as we saw with the previous usage of the word, it does not actually mean “thunder” at all. What we have instead is the continued description of a unique occurrence of voices being heard at Sinai during the supernatural presentation of the Most High in the earth. Even if one would maintain that the term should be understood as “thunder,” the reality remains that the Hebrew text says they “saw” these things. Not only does the text tell us that at Shavuot here at Sinai they visibly saw voices, but that they also could see “torches,” as well. Isn’t that odd? In this strange detail is a beautiful truth concealed for us entirely worthy of our attention. Just as the term QOLOT discussed above does not mean “thunder,” but “voices,” and yet is never translated literally in English versions, so too does the Hebrew term encountered here have a very precise and interesting definition. It is LAPPIDIM, and literally means “torches / lamps,” yet is repeatedly translated in this instance in most every English translation as “lightning.” The usual Hebrew term for “lightning” is BARAQ. Indeed, the plural of this very term is actually used one chapter back in 19:16 – BARAQIM, and is indeed typically translated correctly as “lightning.” The text at this particular point, however, gives a new detail to the record of events occurring at the mountain, and the term LAPPIDIM very rightly is literally translated in my English rendering here as “torches.” Why would the text tell us that “torches” were seen at the mountain? Why also would translators render the clear Hebrew term instead as “lightning?” To be sure, I am not advocating a reading of the text that is overly-literal, for other translators of antiquity also felt that “torches” was the intended detail, and not “lightning,” as evidenced by the choice they made in their versions. For example, the ancient Aramaic translation of the Torah known as the Peshitta translated the Hebrew into the Aramaic word for as “torches,” as did also the ancient Aramaic Targum of Neofiti. We likewise find that the ancient Greek Septuagint text rendered the Hebrew literally as “lamps” in this case. Therefore, we have three witnesses from antiquity further confirming the legitimacy of the admittedly initially bizarre reading of “torches” in the Hebrew text here of Exodus 20:18. And it was [that when] the sun was gone, and it was dark, see! a furnace smoking, and a torch of fire which passed between those pieces! This detail may seem unconnected at first, but the links arise when we realize that the situation involves a man called out from idolatry, who went on a journey to a new land, and who came to a place to await the arrival of his Deity who desired to enter into a covenant with man, and saw a strange appearance of a torch in the air – just as the people of Israel were called out of Egypt, journeyed long through the desert to Sinai, and awaited there the coming of the Holy One to invoke a covenant with them, who there saw the strange appearance of torches in the air! The appearance of the burning furnace and the fiery torch that fulfilled the covenant ceremony in Genesis 15 aligns perfectly with the Presence of the Most High coming in fire upon the mountain and the appearance of torches seen by the people. One could even consider the initial encounter of the Spirit of the Holy One at Mount Sinai / Horeb to Moses as the fire flaming in the bush that did not burn! And there shall come forth a Rod from the trunk of Yishai, and a Branch from his root shall bear fruit. And shall rest upon Him the Spirit of YHWH; the Spirit of Wisdom, and Understanding; the Spirit of Counsel, and Might; the Spirit of Knowledge, and Fear of YHWH. This description of the Messiah tells us that in Him would rest seven Spirits: the Spirit of YHWH (1); the Spirit of Wisdom (2); the Spirit of Understanding (3); the Spirit of Counsel (4); the Spirit of Might (5); the Spirit of Knowledge (6); the Spirit of the Fear of YHWH (7). The passage here is unique in all of the Hebrew Scriptures in that nowhere else do we read of such a specific number of Spirits in connection to the Most High and the Messiah – unless we turn to the New Covenant writing of the book of Revelation. In that text, we find in four different passages the reference to these seven Spirits of the Holy One. Let us look now at those passages and the significance of the LAPPIDIM “torches” seen at Sinai will become apparent. 1:5 and from Yeshua the Messiah, He [who is] the faithful Witness, He [who is] the Firstborn of the dead, and the Head of the kings of the earth, who loves us and frees us from our own sins by His own blood. ​4:5 And from the thrones went forth thunder and lightning, and voices, and the seven Lamps that were burning before that throne – those being the seven Spirits of Alaha. ​5:6 And I saw in the midst of the throne and of the four living creatures, and of the elders, a Lamb that stood as a sacrifice, and having for Himself seven Horns, and seven eyes – those that are the seven Spirits of Alaha that are sent out to all the earth. The purpose of the Hebrew text of Exodus 20:18 telling us that the people saw “torches” at Sinai at the giving of the Torah is thus an incredibly deep portrayal of the Presence of the Holy Spirit at the event where He gave His Kingdom rule to the nation. The Holy Spirit was right in the midst of the moment the Torah was starting to be given to Israel! The heavens were opened and He stepped into this realm in great and awesome power, such that the people at the foot of Sinai experienced things not normal in the physical world – natural law and the creation code of physics adapted to the anomalous Presence of the Creator in a world that was no longer used to the immensity of His glory. Sounds were seen; voices not uttered by any human were heard by the entire nation; fire from heaven fell and lit the summit of Sinai with no earthly explanation; a ram’s horn was blown by the Spirit, who also manifested as luminous torches lighting the entire spectacle – such was the scene for the giving of the Torah to the nation of Israel! All of this is to show that the event of Shavuot was full of the Spirit – it was a distinctly spiritual event in a physical world. The Holy Spirit descended in power upon a specific location and showed His heart in Kingdom law to the people. In like manner, the events of Shavuot at Jerusalem display His coming to us personally. We read the account recorded for us in the book of Acts 2:1-4 with appreciation of the intimacy in which the Holy Spirit came down to His people a second time. 3 and there was seen to them tongues that were divided like fire, and they sat upon each one from them. 4 And they were all filled by the Spirit of Holiness, and they joined in to speak in certain languages, what that the Spirit gave to them to speak. What we have recorded for us in this second prophetic fulfillment of Shavuot and the giving of the Torah is much more scaled down, far more intimate and personal than before. There is no mountain on fire, no terrifying display of the unassailable power of the Creator to be seen. Rather, while the event was certainly full of significance and something that was by no means normal, the nature of this Shavuot / Pentecost displays the personal intent of the Spirit for His people – the Kingdom is to be made up of individual hearts and minds, and yet in that separate, distinct experience of the fullness of the Spirit, we also become linked to one another through His overarching, infinite Presence. The coming of the Holy Spirit on Shavuot recorded for us here in Acts 2 is not to be downplayed, but should be appreciated as the fulfillment of the heart’s desire of the Holy One that initially was laid bare to His people at Sinai – to have a nation of priests – and was so abruptly put on hold with the grievous sin of idolatry with the golden calf. The grand first act of the dream of the Most High was interrupted by idolatry, and the long process of restoring that righteous desire began – a process that we see culminating here in Acts 2 when, after the redemption procured by the Messiah, the Spirit could once more indwell His people and reform the nation of ministers that He longed to share with the world. Even though there are vast differences in terms of scope between the two Shavuots recorded for us in the Word, the people who were experiencing the coming of the Spirit powerfully into their hearts in Acts 2 very likely were also receiving deep revelation and understanding of the amazing parallels between what was happening on that day and what happened on that day some 1,500 years prior when the Torah was originally given. The remainder of this study will seek to display the powerful alignments between the two days, so that the reader can hopefully appreciate the unity of the Spirit and the Spirit’s Law in the lives of His people. At Sinai a mixed multitude of Hebrews and converts received the Torah on Shavuot / Pentecost. At Jerusalem a mixed multitude of Jews and converts received the Torah on their hearts by the Holy Spirit indwelling them on Shavuot / Pentecost. At Sinai the people heard voices they were not speaking on Shavuot / Pentecost. At Jerusalem the people heard people who couldn’t normally speak diverse languages speaking them suddenly and fluently on Shavuot / Pentecost. At Sinai the Torah was given on tablets of stone on Shavuot / Pentecost. At Jerusalem the Torah was given upon hearts of flesh on Shavuot / Pentecost. At Sinai on Shavuot / Pentecost the priesthood was supposed to be a ministry involving all twelve tribes, but became limited to one at the sin of the golden calf. At Jerusalem on Shavuot / Pentecost the priesthood went from being limited to one tribe to involving all who would be freed from their sin by the sacrifice of Messiah. At Sinai on Shavuot / Pentecost the Presence of the Holy One was afar off, at the top of the mountain, and the people could not go near. At Jerusalem on Shavuot / Pentecost the Presence of the Holy One was near, as His Spirit came to the hearts of men. 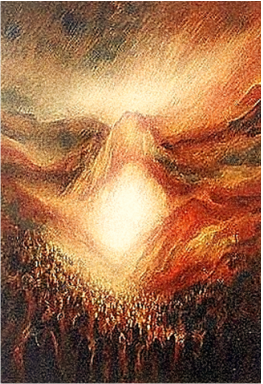 At Sinai on Shavuot / Pentecost the people saw unique fiery torches appear when the Spirit’s Presence manifested. At Jerusalem on Shavuot / Pentecost the people saw fiery tongues appear when the Spirit’s Presence manifested. The number of people groups listed explicitly at Sinai on Shavuot / Pentecost was three: Hebrews, the mixed multitude, and Moses’ wife – a Midianite. The number of people groups listed explicitly at Jerusalem on Shavuot / Pentecost was three: the native-born Jews, the Diasporic Jews, and the converts from the nations. Additionally, the Torah later commands that special offerings be brought on Shavuot / Pentecost – two different groups of fourteen total offerings (see Leviticus 23:17-20 and Numbers 28:27-31). The grouping of people present at Sinai on Shavuot / Pentecost could also be viewed as fourteen: the twelve different tribes, the non-specified mixed multitude, and Moses’ Midianite wife. The grouping of people present at Jerusalem on Shavuot / Pentecost could also be viewed as fourteen: the Jews, and the list of Diasporic Jews from twelve different countries, and the converts from the nations (see Acts 2:9-11). The parallels between the two events go on, but for space I leave the topic to close this study with one further thought that I hope shall serve to bring it all together. The giving of the Torah was an ultra-spiritual event wherein the Presence of the Holy Spirit was manifested to an entire nation in the wilderness. The heart of the Holy One was revealed to His people: He desired true fellowship and partnership with them in the world. The coming of the Holy Spirit at Shavuot in Jerusalem so many generations later did not annul the importance of the original events at Sinai, but when properly understood, served to show us the united purpose of the Most High in both the giving of the Torah and the giving of the Holy Spirit. Perhaps Yeshua’s disciple Paul said it best in his letter to the believers in Rome in the book of Romans 7:14-16, where he wrote about the nature of the Torah and the believer’s proper assessment of the Spirit-given commands. 15 for the thing that I do is unwittingly, and the thing I do not desire, [that] I perform; but instead, the thing that I hate is what I perform. 16 And if the thing that I do not desire is what I perform, I witness concerning the Torah that it is beautiful. The words Paul wrote here can be appreciated much more when the correct view of the Spirit-giving nature of the Torah / Law is understood. The first Shavuot / Pentecost was a gift of the Holy Spirit, just as the second Shavuot / Pentecost was a gift of the Holy Spirit. The people of the Most High have been blessed with a Kingdom law in the Torah and the spiritual power to perform it by the indwelling Presence of the Holy Spirit in our lives. This amazing work of the Holy Spirit in our lives was clearly prophesied in the Word in such passages as Ezekiel 11:19-20 and 36:26-27 – a truth that is unfortunately not widely taught when the results of Presence of the Holy Spirit in our hearts is discussed. While gifts and fruit are the two major topics of what having the Spirit entails, the Hebrew Scriptures of these referenced verses tell us the indwelling Presence of the Most High does another major thing for us – it enables us to perform what He has called us to do! The unity of His covenants is thus displayed for us when we take the time to dig deeper than the traditional explanations of the events of Shavuot / Pentecost at Sinai so commonly espoused by well-meaning teachers through sloppy translators. Errors of traditional teaching fall away as the truth is uncovered and His will rightly given the honor it deserves in our lives. The giving of the Torah / Law and the coming of the Holy Spirit are unified in that the same Spirit gave both to His people, to place in our midst His Word, to be filled and transformed individually and as a nation by adopting what is on His heart into our own.